Pow…Pow…Pow! Three flavor packed ingredients hitting ya in three different directions. That’s how I would describe this quick bread. Seriously – what could be better than mixing apples with cinnamon, then adding chopped pecans to the party. That’s right…nothing! Of course no party would be complete without a sweet host, that’s the brown sugar, and some killer tunes. Better yet, killer Canadian tunes such as those from The Tragically Hip’s album Road Apples. That's the food, mood and music experience I created while preparing this bread. When the song Three Pistols came through the speakers, I knew I had to use the song title for the name of this recipe. 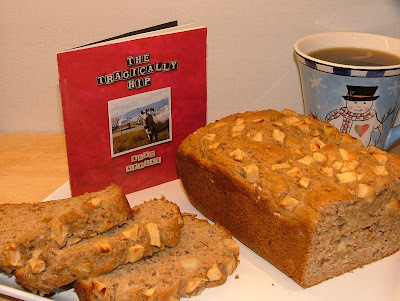 I certainly wasn’t going to call it Road Apples bread...a slang term used to describe frozen horse droppings. Sorry to ruin your appetite, but now you know. I actually had a hard time preparing this recipe. Not because it is difficult to make but because I couldn’t stop eating the chopped pecans. Beware! 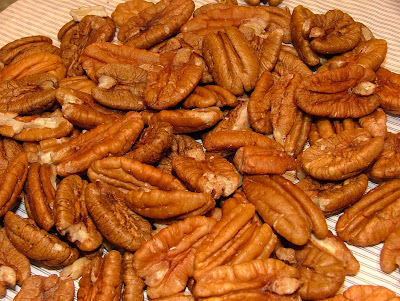 Pecans are very addictive. I have a feeling you're going to enjoy this bread as much as a Canadian enjoys a good Hip tune. It's three pistol harmony of apples, cinnamon and pecans is certainly hard to resist. Spray a 9 x 5-inch loaf pan with cooking spray. Set aside. In a large bowl combine flour, wheat bran, baking powder, cinnamon, baking soda, salt and allspice. Set aside. In medium bowl whisk together apple sauce, sour cream, egg, 1/2 cup brown sugar,oil and vanilla. Add to dry ingredients and mix just until moistened. Gently fold in pecans and half the apples. Spoon batter into prepared pan and smooth top. In a small bowl toss remaining apples with 1 tsp brown sugar. Place apples evenly on top of batter. Bake in a 350º F oven for 35 to 40 minutes or until loaf is lightly browned and a toothpick inserted in center of loaf comes out clean. Cool loaf in pan for 10 minutes. Remove loaf from pan and let cool on a wire rack.